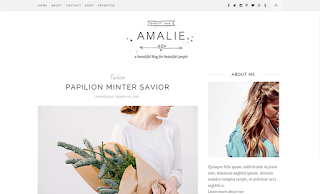 Amalie Blogger Template is a clean & minimal Blogger template suitable for any type of blog. It’s very flexible premade blogger template, fully customizable and powered with Blogger option Framework. From fashion to beauty and lifestyle bloggers, Amalie’s optimized, responsive design delights and converts visitors into email subscribers. You will love the smooth and fast user experience. This theme if perfect for personal blogs, lifestyle, makeup blogs, beauty blogs, OOTD (Outfit Of The Day), Fashion and even Food and Recipes Blog.